More than 430 people have been killed and many more missing in recent flash floods triggered by typhoon Washi in the southern Philippines, officials say. Many of the victims were asleep when it struck Mindanao island, hitting the cities of Iligan and Cagayan de Oro. Tens of thousands of people have fled to higher ground, the authorities say. Benito Ramos, head of the national disaster rescue agency, said reports were still coming in and the casualty figures could rise. He said the floodwaters had risen alarmingly fast overnight as people slept. “Massive flooding had been reported over the region, especially in Iligan City and Cagayan de Oro City,” Benito Ramos said. Rivers burst their banks after 25 mm of rain fell in 24 hours. The Philippine National Red Cross Secretary General Gwen Pang said at least 430 people had been killed. Gwen Pang said 215 people had been killed in Cagayan de Oro and 144 in Iligan. Large areas were left without power and some domestic flights were cancelled as winds of up to 90 km/h (55mph) swept across the island. A landslide killed at least five people in the east of the island, the national disaster agency said. A military spokesman, Colonel Leopoldo Galon, said an entire army division – some 10,000 soldiers – was involved in the rescue efforts around Cagayan de Oro. Forecasters said the eye of Tropical Storm Washi had passed close to Dipolog City, west of Iligan City, early on Saturday and it was now heading out into the Sulu Sea. 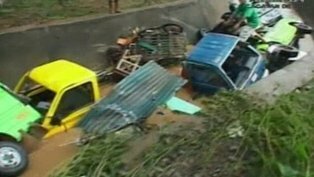 Floods had swamped a quarter of Iligan and at least 10 villages on its outskirts, said the city’s mayor, Lawrence Cruz. “It’s the worst flood in the history of our city,” Lawrence Cruz told GMA television. The coast guard and other rescuers were scouring the waters off the coastal city for survivors or bodies, he added. GMA television broadcast dramatic footage of a family escaping their flood-hit home by climbing through a window. Rescue workers were pictured helping survivors to safety in chest-deep floodwater. Three people also drowned in Polanco town in Zamboanga del Norte province, said provincial disaster officer Dennis Tenorio. He said high winds had toppled trees. The storm is set to hit the western island of Palawan later on Saturday, after crossing the Sulu Sea with winds of up to 75 km/h, according to state weather forecasters. The Philippines are struck by about 20 major storms every year but most of them take a more northerly track, hitting Luzon island. Benito Ramos said Washi’s toll may have been so high because Mindanao residents are unaccustomed to catching the full force of such storms. He said officials had given four days of warnings that the storm was approaching but many people had chosen not to evacuate their homes. Typhoons Nesat and Nalgae battered the country within days of each other in September, leaving more than 100 people dead. Both storms struck Luzon.